Skype founders Janus Friis and Ahti Heinla are leaving their offices and moving into the streets with their latest venture, Starship Technologies, which they hope will transform how goods are transported to consumers. Instead of the omnipresent man-and-a-delivery-van, they hope to be operating fleets of self-driving distribution robots that will take over delivery in the ‘last mile’. The notorious ‘last mile’ is known to be the most inefficient component of shipments in today’s delivery-focused society, especially in cities where the last few kilometres often takes up most of the total shipping cost. With setups in London and Estonia’s capital city, Tallinn, the company is testing a wheeled robot that it expects to be cheaper and faster, and also more eco-friendly than the traditional man-and-a van delivery method. Each wheeled robot is built from off-the-shelf electronics, including an array of sensors to allow it to travel alongside pedestrians on regular pavements. Although the robots will be equipped with collision evasion as well as navigation software and are planned to run independently the majority of the time, they will also be able to be controlled by a human operator for safety reasons and to ensure that the deliveries are successful. The robots will have the capacity of a small car boot in which to carry items which will be locked inside the robot and openable only by the receiver. For the plan to be successful, deliveries will still be moved in bulk by current human methods to regional centres before being turned over to the robots for the final step. As they travel around, the robots will be monitored by the controllers and also accessible by the delivery recipients using an app. Currently, the company is in the testing phase but expects initial trial services to begin operating in several countries in 2016. Daimler Trucks has just retro-fitted its self-driving system known as the Highway Pilot to a Mercedes-Benz eighteen-wheeler lorry and, as of late, has been driving it down a stretch of the German Autobahn. This has now become the latest milestone in the development of self-driving vehicles with it marking the very first time a self-driving production truck has been evaluated for its self-driving capabilities on a public highway. As with self-driving cars, Daimler says improvements to motorist safety is a convincing reason to also develop the technology for the road-shipping industry. By allowing self-driving systems to aid the lorry driver on any long-haul trips, Daimler claims it can help prevent operators from falling asleep at the wheel as well as limit the number of driver errors. In addition, when it comes to switching gears for speeding up or slowing down, the autonomous system can be more economical with fuel consumption reducing the carbon footprint of the vehicle in the process. The device uses both a short-range radar that can scan up to 70 metres ahead of the vehicle over a 130-degree arc, and a long-range radar that allows the vehicle to ‘see’ up to 250 metres ahead of it in a smaller 18-degree arc. The radars also operate in combination with Active Cruise Control, Active Brake Assist, as well as ‘steering’ cameras that keep track of roadway markings. However, as of yet, Highway Pilot is not yet advanced enough to allow drivers to completely relax on their journey as the operator still needs to be ready to take control of the vehicle in unexpected situations. So, while self-driving trucks still seems a long way off into the future, the chance to assess the technology in real-world situations will certainly help in bringing it ever closer. Robotics studies are moving along at such a quick pace these days that it is often tough to identify the significant turning points in the development of this modern technology. One significant step forward is a new robot being developed at MIT called Hermes. Like other robots, it’s completely made of inorganic materials and electronics, but its actions as well as its reflexes are human as it is controlled by a human operator. In order to acheive this, the robot feeds back relevant information concerning its equilibrium and spacial positioning in real-time so the human controller has the ability to readjust his/her feet and physical body accordingly. That human-generated data in turn is then relayed in real-time back to the robot, thus keeping it balanced. This technique addresses one of the major issues for humanoid robots ie. keeping upright on both feet is no mean feat. Simply put, the reflexes of the machine to a changing surface or from poke in the rear are essentially human. In addition, the mechanical graspers of Hermes are also special. These three-fingered claws can easily pick up objects, crush tin cans or even pour coffee. 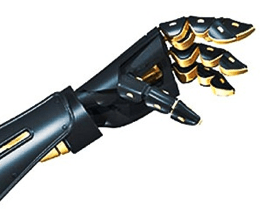 Utilizing joysticks designed into the human exoskeleton, the human controller is able to grab items in front of the robot as well as interact with the environment with more precision compared to a machine of this type would normally have. There are plenty of benefits to having a human controller command a robot, as the machine can take advantage of hundreds of years of human brain evolution. In return, the human can take advantage of the robot’s resilience by being able to stay out dangerous situations for example, after a natural catastrophe or travel to another world. To top it all off, the robot also comes with is a 3D headset that makes it possible for the human controller to see whatever in front of Hermes. Whether attempting to maneuver through a set of enclosures or trying to pick things off the floor, it gives the operator a greater feeling of awareness of the robot’s environment. Scientists at MIT and Northeastern College have integrated a visual sensing unit, known as the GelSight sensor, into the manipulator arm of a robot. They utilized the GelSight sensing unit to image a USB symbol on a standard plug. For it to do this with even more accuracy, the cube-shaped sensing unit used 4 LEDs, each from a different angle. By examining the relative levels of the LED light on numerous parts of the USB icon, the sensing unit was able to determine the plug’s three-dimensional placement relative to the robot’s gripper. The bot then relocated the plug end of the cord over to a USB outlet and properly inserted it. Without the sensing unit, the robot could not insert the plug, as it could not figure out the USB plug’s orientation. This is the main reason why robots usually have to have items exactly set in place beforehand. The GelSight sensor might enable robotics to be a lot more versatile when maneuvering objects in the future.